Dogs and tigers and hockey, oh my. On Friday night, the Kootenay Ice are hosting the Medicine Hat Tigers in another crucial game of their end of the season playoff push. In addition, it will be ‘Maritime Travel Night in support of Therapeutic Paws of Canada’ with the dogs from Cranbrook’s branch of Therapeutic Paws getting an invite and participating in an intermission contest. The Ice will be looking to put together a good performance in front of their canine friends. Two points out of third place in the Central Division — the final available playoff spot in the Eastern Conference — Kootenay is in must-win mode. While they’re entering the night on a three-game losing streak, the Ice have been competitive in all their recent efforts. On Tuesday, playing the Tigers on the road, the team had the game tied until the tail end of the third period and then fell 3-1. According to head coach James Patrick, despite recent setbacks, the desire to win is strong in the locker room. The current holders of the final Central Division playoff position, the Red Deer Rebels, lost to the Calgary Hitmen on Wednesday night, meaning that if they lose again on Friday and Kootenay wins, the teams will once again be tied with 55 points apiece. While fans might watch the Rebels results closely, Ice forward Cam Hausinger says that the desire to catch them is even stronger with the players. “We know we’ve got to win games,” he said. “That’s a big factor for us right now, and that’s our motivation. We all want to make the playoffs. So far this season, Kootenay has a 1-3-1-0 record against Medicine Hat, and have had some tight battles. As the two least-penalized teams in the league, their games come down to a lot of 5-on-5 play. 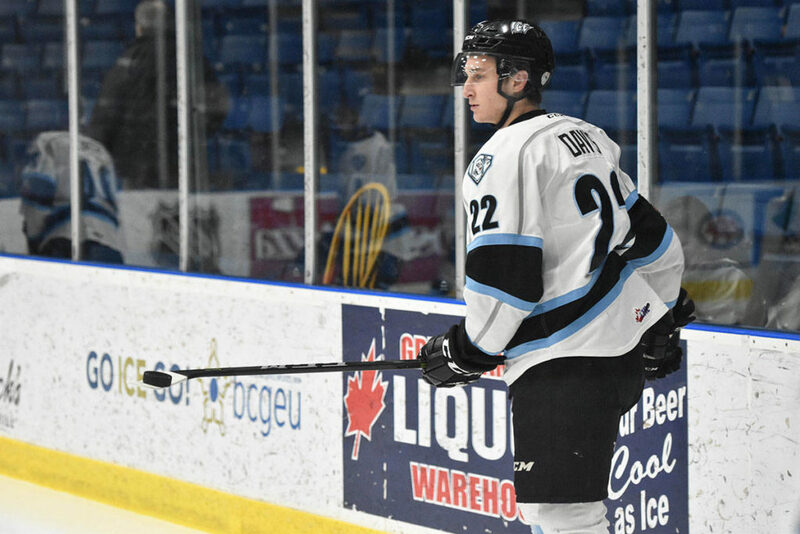 Brett Davis has had the most individual success of any Kootenay player so far this year against the Tigers, with three goals and an assist in five games. For the opposition, captain Mark Rassell has been absolutely lethal against the Ice, with 6 goals and three assists in five games this season. Overall, Rassell is fourth in the WHL in goal-scoring with 45 in 61 games. Alec Baer has the most goals on the Ice, with 24 in 62 games. According to Patrick, the Tigers are a team who can make life extremely difficult for its opponents. There are 10 games remaining for the Ice in the 2017-18 season and only five home contests left. Kootenay has been a much better team in Cranbrook than they have been on the road, and have a winning 15-4-2-0 record at Western Financial Place. “It’s going to be an emotional game,” Hausinger said. “They don’t take a lot of penalties, and they skate well, so we just have to keep moving our feet. Following Friday night’s game, the Ice play on the road against the Spokane Chiefs on Saturday, before getting a few days off. The Ice could have a significant injection of youth into their roster this weekend, as well. Their top draft pick in 2017, Connor McClennon (second overall) was recalled last week, and has two available affiliate player call up games remaining, while second round pick Anson McMaster (23rd overall), a defenceman, was recalled on Wednesday. McMaster could make his WHL debut, after proving himself worthy in 35 games with Okotoks Oilers of the AMHL, where he has 13 assists. Puck drop against the Tigers is at 7 p.m. The Therapeutic Paws promotion will be highlighted by a tennis ball toss during the second intermission, where the dogs will run out onto the ice and grab eight tennis balls. From there, four tennis balls will be selected as the winners, and those who purchased them will be awarded prizes provided by Maritime Travel. Saturday’s game in Spokane will be the team’s fifth and final match against the Chiefs for the year. The Ice have a 1-2-1-0 record against them, and lost their last meeting 5-3, in a night in which their star player Kailer Yamamoto had a goal and four assists.